Over the years I've noticed that wherever you travel in the world people think they make the best beer. Canadians, for example, are convinced their brew is world-class because they live next door to the United States, which is the world's largest producer of undrinkable beer. Australians reckon their stuff must be superior simply because they drink so much of it. They never stop reminding you that, despite what you see on the TV commercials, real Aussies drink, not Foster's, but XXXX or Victoria Bitter. This is true, but irrelevant, as both Four-X and VB taste exactly like Foster's. "Beer is to Belgium as wine is to France," say the Belgians, but it's not true. There are some lovely monk-brewed beers, but ninety-five percent of all beer in the country is made by the huge, international behemoth Interbrew. Interbrew (the General Motors of the beer business, with all the quirky individuality that entails) sells hundreds of beers under hundreds of names all of which taste suspiciously like Stella Artois. The Dutch think it's wonderful that Heineken and Grolsch are sold all over the world and they do not like to be reminded that both are monolithic international brands, brewed locally, to local recipes, by local firms, and sold to pretentious poseurs who think it's a classy order that's sure to impress the hottie waitress. German beer isn't all it's cracked up to be, though the "Reinheitsgebot" or "Purity law of 1516" ensures that only water, malted barley, hops and yeast go into the brew. Given the nasty things some brewers use to tart up their suds (formaldehyde to make foam, for example) the law makes sense and it certainly does make the beer more healthful and less likely to produce a hangover if consumed in excess. But what the Reinheitsgebot does not do is enhance the flavour. It's a bit like eating natural, organic, pesticide-free broccoli — safe, good for you, but at the end of the day, still broccoli. The Czechs tout their beer by saying it's just like the German stuff, but they don't even have a purity law. Oddly enough, in Britain, the country where the world's best beer actually is made, people don't brag about it. In fact, most of them don't even drink it. Traditional British ale is now far outsold by bland, watery lager and would have vanished altogether were it not for the dedicated efforts of a small group of real ale enthusiasts. Traditional British beer, or "real ale" as it's generally called, is beer like no other. Keg beer (the crummy stuff you're drinking now) is designed for convenience, mass marketing, immediate consumption and long shelf-life. It's brewed in massive quantities and, once fermented, is chilled, filtered, pasteurized, pumped into steel kegs and gassed up with CO2 to make it easy to dispense. Real ale, on the other hand, is designed for taste, not convenience. It is neither filtered nor pasteurized and, like a fine wine, continues to ferment whilst in the barrel. Real ale requires care in handling, needs to stand for a day or two before drinking, and must be consumed within a few days. The difference is immediately clear. Keg beer is dull, tasteless and indistinguishable from brand to brand. Real ale is exciting, alive with flavour, and bursting with individual personality. Think of the contrast between instant coffee and espresso or canned soup and Grandma's broth. Now apply that analogy to the watery suds you've been drinking, multiply by a factor of ten, and you'll have some small idea of what I'm talking about. If you're a beer lover, real ale provides reason enough to visit Britain. But if you do, be aware. Not all pubs sell real ale and not all beer is real ale. It's easy to be fooled. I'd been in Britain a full week (which, for me, represents a fair amount of drinking) before a kindly bartender sat me down, poured me a pint, and explained that the stuff I'd been guzzling like water for the past seven days was, to use the local vernacular, "crap beer." Finding real beer and a decent pub takes a little effort. It's not terribly difficult, but you have to know what to look for. Scan the hanging pub sign, the pub's front windows or any a-frames nearby for the words "real ale," "traditional ale" or "cask-conditioned ale," all of which mean the same thing. On the other hand, don't be fooled by the phrase "free house." This means, simply, that the pub is not owned by a brewery; it says nothing about the quality of beer served. Keep an eye out for endorsements or awards from CAMRA, the Campaign for Real Ale. This small lobby group has been single-handedly responsible for preserving and promoting traditional British beer. When I mentioned earlier the "dedicated efforts of a small group of real ale enthusiasts," these are the folks I was talking about. To find out more about CAMRA visit www.camra.org.uk. Look for the brands "John Smiths" or "Tetley's" and avoid both. Don't be concerned if either are on offer (many pubs sell decent beer as well as John Smiths), but if the exterior of the pub is festooned in John Smiths or Tetley's logos you can be sure one of these massive, corporate brewers of sludge have their hooks into the pub and are continuing their practice of using marketing muscle and cash incentives to drive out real ale and replace it with the watery, tasteless glop they laughingly call beer. Count the "fruit machines." Fruit machines are video games with an element of low-stakes gambling added. They are loud, flashy, obnoxious and annoying to anyone trying to enjoy a quiet pint or a friendly conversation. You'll rarely see a pub without one, but any pub with more than one or two fruit machines is best avoided. Cast a keen eye over the bar. If all the beer is dispensed from taps that can easily be turned on or off with a simple twist of a pinkie finger, then you're in the presence of shoddy keg beer. But if you spot a rack of tapered wooden handles, trimmed in brass with stainless-steel spouts that curve upwards then down to a spot about six inches from the drain, chances are you're close to a real pint. Look for a Wetherspoon's pub. 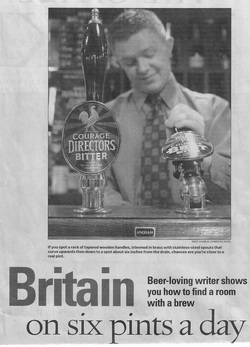 Wetherspoon's is a large company that operates huge, modern pubs in just about every city or town in Britain. Their pubs have absolutely no character whatsoever, but they do have two redeeming features. First, they serve huge platters of tasty, greasy, filling food at reasonable (for Britain) prices. And second, they serve a good range of real ale. Don't look for atmosphere. Don't expect any local flavour. But if you're stuck in the middle of British nowhere in desperate need of a burger, fries and a pint of real ale, you'll find all three at your nearest Wetherspoon's. It's not easy to find a good English pub, but it's worth the effort. Not only is the beer heaven in a glass, but you'll find no more convivial atmosphere anywhere. It doesn't matter where you're from, what your accent, how old or young you are, how you're dressed, what you do for a living, or whether you're rich or poor, you can be part of a tight-knit community tradition that goes back to the days of Shakespeare and sailing ships and knights on horseback. Not a bad deal for the price of a pint, huh? Ottawa writer Mark Hill is drinking Cains Mild, if you're offering.